HOLLAND, Mich. (March 22, 2017) — Elzinga & Volkers, a leading West Michigan construction company, today announced that the organization has been honored with the Associated Builders and Contractors, Inc. National Safety Excellence Award. 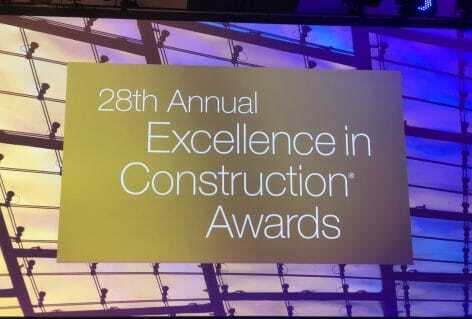 E&V received the award at the 28th annual Excellence in Construction Gala on Wednesday, March 21 in Long Beach, California. Awards are based on data submitted through Safety Training Evaluation Process (STEP) applications, essay questions and video interviews with company presidents, CEOs or principals about their corporate safety culture. Award categories are based on a company’s total work-hours per calendar year and placement within the North American Industry Classification System (NAICS). “Winning a National Excellence in Safety award is a tribute to all employees of E&V and their never ending quest to provide a safe work environment for all,” said Tony Roussey, chief operating officer of Elzinga & Volkers. The award comes at the perfect time as it is currently Elzinga & Volkers annual safety week. The organization held a Safety Symposium on Monday March 19 and has events all week long to promote workplace safety. E&V is thrilled to receive this great honor and will continue to keep work place safety at top of mind in the years to come.